Highly sought after by movie poster collectors and aficionados. Get notified of our AUCTIONS & NEW INVENTORY instantly! This is a genuine 45.5" x 59" U. SUBWAY ORIGINAL MOVIE POSTER issued by the studio when the film was released. This poster has been Linen Backed and is ready for framing. An extremely popular and very rare HORIZONTAL format American movie poster measuring approx. Subway sheets are printed on a thicker paper than one-sheets. Most contain the same artwork as the advance materials, and are almost always issued as advances. They are most often found in subway displays. These posters can be either rolled or folded. Some collectors like the subway sheet because there are fewer of them released. They are somewhat large and cumbersome, but because they are printed on a thick paper, they are more durable. HIGHLY DESIRED DUE TO ITS HORIZONTAL FORMAT AND EXTREME SCARCITY! These can be very difficult to find in any condition! A long time can go by without one of these coming up for sale. You will have trouble finding a nicer one. Linen backed for preservation only. This poster is considered to be within that class and is definitely INVESTMENT QUALITY. This is NOT a reprint or reproduction poster! It is a REAL ORIGINAL MOVIE POSTER issued by the studio when the film was released. We are absolutely certain it is authentic. We use super strong hi-quality packaging materials including thick cardboard, masonite, and costly pvc plastic pipe. And guaranteed to arrive safely. (Please see below for details). We grade our posters according to the Iguide Universal 10-Point Movie Poster Grading Scale. C10 Mint - Investment quality. No perceptible flaws of any kind. C9 Near Mint - Investment quality. Minor flaw on an otherwise unused poster. C8 Excellent - Investment quality. C7 Very Good to Excellent - Fine condition. Still a very nicely preserved item. C6 Very Good - The typical used poster in average condition. C5 Good to Very Good - A heavily-worn item. C4 Good - Below average but still suitable for display. C3 Fair - Heavily worn, but yet still complete. C2 Poor to Fair - An extremely worn, possibly even incomplete item. C1 Poor - The lowest grade, representing items in the lowest possible condition. Some of our posters are "between grades". For example, a C8-C9 poster will contain all the qualities/characteristics of a Near Mint C9 except for one or two very minor flaws that we believe prevent it from being a true C9. Sometimes it isn't possible to do this. Sometimes we can't roll a folded poster. Please note that if we hold your items for longer than 30 days they will NOT BE RETURNABLE. WE TAKE EXTRA SPECIAL CARE WHEN WE PACKAGE YOUR ITEMS. Folded posters are placed in a plastic bag or envelope and in between STRONG pieces of cardboard and taped together before being placed in the package. Rolled posters are put into a plastic sleeve and then placed in a HEAVY-DUTY TOUGH 3 or 4 diameter thick walled PVC tube. We roll the poster into a smaller diameter than the tube. This is VERY IMPORTANT because it gives the edges strength and helps to prevent them from getting wrinkled. We add soft cushioning material also very important! Unless otherwise specified in the description, ALL POSTERS ARE ORIGINAL MOVIE POSTERS original theatrical movie posters that were displayed or meant for display (unused) in theaters at the time the movies were released. We will put in writing that we guarantee it to be an Original Movie Poster. 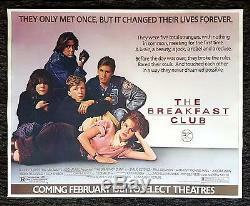 The item "THE BREAKFAST CLUB CineMasterpieces ORIGINAL RARE SUBWAY MOVIE POSTER 1985" is in sale since Saturday, June 18, 2016. This item is in the category "Entertainment Memorabilia\Movie Memorabilia\Posters\Originals-United States\1980-89".